Hi there it’s me Mateo how are you doing today? Just want to give a few tips on content marketing for social media. The world of marketing and advertising is changing. It’s no longer as simple as running a TV, Radio or Newspaper ad or even paying the search engines for keywords to get leads for our business. The world of Social Media where and why consumers choose a product or service has changed. The internet has given the power to the consumer to research products and services very simply on their own. Social Media provides a direct connection between company and consumer. Unhappy with a product or service, tweet at the company or leave a Facebook Comment it will get noticed. Happy with a product or service brag about it on your Social Media profile it will get noticed. The smart phone and Social Media applications is now the key to our next customer relationship. Our customers have Social Media applications on the home screen of their smart phone, not our business website or phone number. We have to be active on these social platforms because that is where our next client is hanging out, spending time and getting information. If you are like me I comment, like or share content I find entertaining, interesting, inspiring or educational. Creating content that fits within these parameters is the key to success marketing on Social Media. Creating the right content mix will insure that when our audience is looking to make their next purchase or choose a service our business is top of mind. 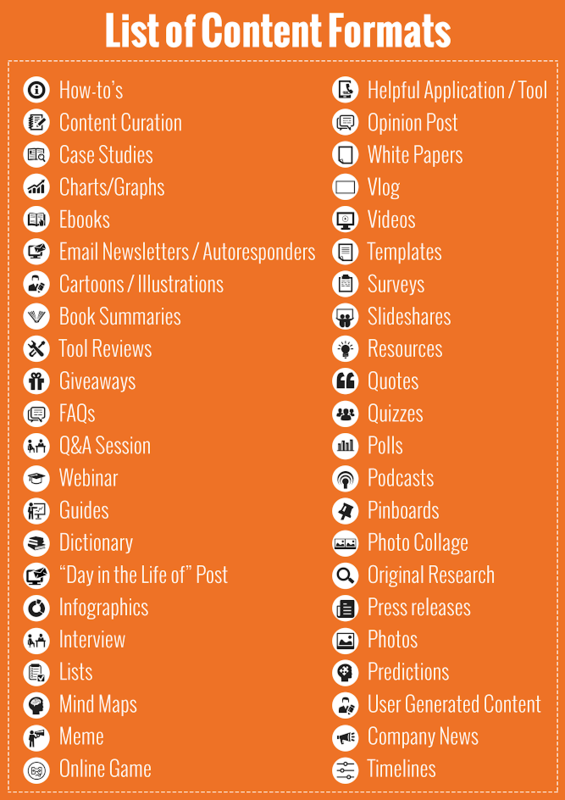 Here are a different content formatting tips via Hubspot we can include in our social media strategy. Don’t get overwhelmed with having to do all of these. Choose the best content format that will most benefit the Target Audience and easiest to implement. Let’s try to put ourselves in a position of a potential client when we are on Facebook or our favorite social media platform. When creating a post for business let’s ask, Would I click on this? Would I like this? Would I share this? Is this interesting? Social Media Marketing is not about pushing every single link or website promoting our business in front of a consumer. Social Media marketing is about creating micro content that would fit into the entertainment, interesting, informational, educational or inspire category. It’s ok to brag about accomplishments every once in a while. Some of our audience wants that, but do we really like someone who talks about themselves all the time and how great they are? Once a decision has been made on what content formatting is best do the following. Every post is not going to be perfect, but if there is a meaning and purpose behind each social media post it will improve results. Networking and marketing on Social Media is not going away anytime soon, let’s embrace it. I hope these tips are helpful, if I can ever help in anyway it would be my pleasure.